Biological weapons are organisms or their by-products used to deliberately spread disease. They include bacteria, viruses, rickettsiae , protozoa , fungi , and their toxins. The effects of biological warfare agents are diverse, but they generally incapacitate or kill their victims, or destroy crops or livestock. Biological weapons have been used for centuries. The Tartar army catapulted plague-ridden corpses over city walls in the 1346 siege of Kaffa. All major participants in World War II developed biological weapons, however Japan, which dropped bubonic plague–infested debris on Chinese cities, was the only country known to have used them. In 1969 the United States abandoned research and production of biological weapons. Within three years, remaining U.S. stockpiles were destroyed. In 1975, 118 countries signed the Biological Weapons Convention that outlawed the development, possession, and stockpiling of biological weapons. Biological weapons are often called "the poor man's weapon of mass destruction" because they are cheap and easy to produce. The production processes used to make biological weapons are similar to those used to develop medicines or make yogurt. Since facilities, equipment, and supplies resemble those for biotechnical and medical research, they can be hidden within legitimate facilities, making it difficult to track development of biological weapons. Compared to chemical or nuclear weapons, biological weapons are easily handled and effective in small amounts. 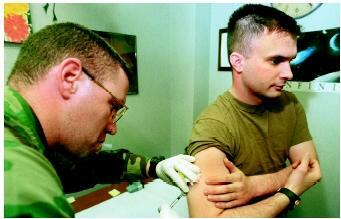 An American soldier receiving an anthrax vaccine before shipping out to Korea in February 2000. Inhalation of anthrax spores causes severe respiratory distress, shock, and death in about five days. conventional warhead or sprayed from a plane or a small canister. Attacks are nearly impossible to detect in early stages and may not become known until symptoms of disease appear. Defense against biological weapons may include protective clothing and masks, vaccinations, and antibiotic or antiviral therapy. Quick identification of biological agents is essential to save lives and maintain military effectiveness. There are more than sixty potential biological warfare agents. Two of the most common are anthrax and botulism. The anthrax bacteria, Bacillus anthracis, commonly cause disease in cattle, horses, and sheep. In humans, cutaneous anthrax, which causes skin ulcers, accounts for about 95 percent of U.S. cases, with little mortality. However, inhalation of anthrax spores destroys lung and intestinal membranes, causing severe respiratory distress, shock, and death in about five days. Although antibiotics can be used, the mortality rate for inhaled anthrax is nearly 100 percent after symptoms appear. Anthrax is easy to cultivate and forms highly resistant spores that can remain active and potentially lethal for at least forty years. Botulism is caused by Clostridium botulinum neurotoxin. Inhaling a very small amount of this bacterial toxin blocks electrical signal transmission in the nervous system and causes progressive muscular paralysis. Paralysis of respiratory muscles leads to asphyxiation and death. Tracheostomy and use of a ventilator reduce mortality, but recovery may take months of intensive nursing care. Advances in biotechnology may produce biological weapons that are even more toxic, fast acting, and resilient. Genetic engineering may produce new organisms or toxins designed to target specific populations. Cloning techniques may allow for mass production. Biological Weapons. Special Edition of the Journal of the American Medical Association 278, no. 5 (1997). Solomon, Brian, ed. Chemical and Biological Warfare. New York: H. W. Wilson Company, 1999.